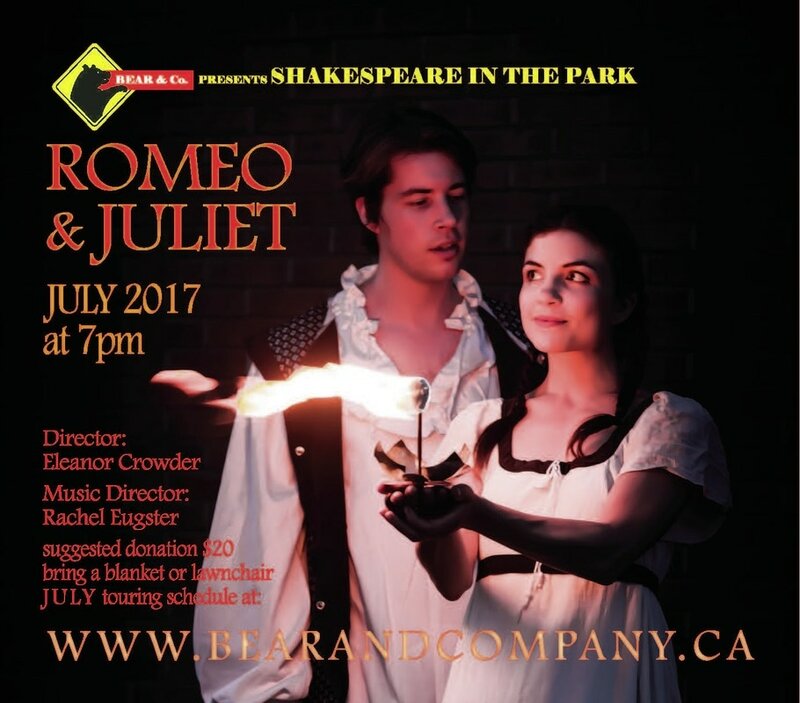 Romeo & Juliet - Bear & Co.
Shakespeare in the Park: Romeo and Juliet toured parks in and around Ottawa July 2017. Passions soar and hearts break in this 90-minute version of Shakespeare's love story for all time. Here is love as obsession--love in a time of darkness. Here is craziness in the face of a culture where honour killings are rampant, and death is a better option than marriage to a chosen suitor. Join us outdoors to celebrate the long evenings and warm weather and enjoy theatre that stands the test of time. Bear & Co. brings you an experience close to the touring companies of four hundred years ago. Bring a cool drink or a full picnic, raingear in case it mizzles, and bug spray, and watch six actors conjure the warring families of Verona in front of your eyes, while letting you in on the technical fun of staging a play in the open air. Check out our tour schedule, below, find out when we'll be playing near you. What's up for Bear after Romeo & Juliet? and Grounded (Jan. 17 - 27), both at The Gladstone. What a rainy year! But we love an audience wrapped in weatherproof gear. Unless conditions are dangerous (the presence of lightning, or footing so slippery the actors are at risk) THE SHOW GOES ON! Zoe Georgaras (Juliet) and Phillipp Merriman (Romeo). CBC News Ottawa caught a scene at the Billings Estate Museum. Rachel has served as music director for Bear & Co., Salamander Shakespeare Co., Gladstone Productions, and the GNAG Theatre Program, and as an interim conductor for Aiyue Choir Ottawa. Helping a cast prepare for a rollicking summer of singing outdoors is a particular delight. As a performer, Rachel appeared most recently at the Gladstone in Jacques Brel Is Alive and Well & Living in Paris, as Martha in Who’s Afraid of Virginia Woolf? (both Bear productions), and as three different men in Anton in Show Business (Three Sisters). In 2015, she played Æmilia in the premiere at the Ottawa Fringe of her first original play, Whose Æmilia?, whose central character might—or more likely, might not—have been Shakespeare’s Dark Lady of the Sonnets. Watch for her this fall at the Gladstone in Bear's No Way to Say Goodbye: Songs of Leonard Cohen! Zoe began performing outdoors at the foot of the Sacré Coeur while attending École Phillip Gaulier in Paris, France. Since then, her approach to performance has been experimental and multidisciplinary, at the intersection of dance and theatre. Zoe produced and performed The Red Shoes (Ottawa Fringe 2016), a one-woman touring show The Burning Place (summer 2016), and several tours to fairs, festivals, and corporate events, under the stage name Zola Molotov and with her company Moon Ballad Circus. Romeo & Juliet is Zoe’s third show with Bear & Co., as she appeared in The Tempest (Ariel) and Macbeth (Witch 1, Duncan, Seyton, Porter). From time to time, you can also watch Zoe play Patricia DuPoisson in BigTime Productions' murder mystery The Codfather at the Red Lion Public House. Phillip is humbled to be performing with such a talented group of artists and to be appearing for the first time with Bear & Co. in Romeo and Juliet. Past credits include: Trip (Other desert cities), Melchior Gabor (Spring Awakening), Barry (The Murder Room), David Larrabee ( Sabrina Fair), and Christopher Wren (The Mouse Trap). David is an Ottawa-based actor and musician. This is his first show with Bear & Co. since covering 10,000 kilometres touring a production of Eleanor Crowder's original play Momma's Boy. He is thrilled to be part of this fantastic team bringing Romeo & Juliet to parks across Ottawa and beyond. Big thanks to Mel and the ladies of Mensour, and to Eleanor, Rachel, and Chris for their direction and enthusiasm, and for keeping warm cups of tea on hand. Chris McLeod made his professional acting debut with Odyssey Theatre in 1988. Subsequently, he received an Honours Degree in directing from the University of Ottawa and a Masters Degree in stage directing from the University of British Columbia. He lived in Germany and returned to Ottawa to become Director in Residence with A Company of Fools in 1998. He was an actor and Artistic Director of Salamander Theatre for Young Audiences from 2000 to 2012. Chris has been a founding partner of National Stage Combat Training Partners since September of 2011. He returned to acting for adults as Comte De Guiche in Plosive Production's Cyrano de Bergerac in 2012. This is Chris's third summer in the park with Bear & Co. He played Prospero in The Tempest in 2015, and last summer he appeared as Macbeth. Romeo & Juliet marks J. 's Bear & Co. debut. Local audiences may recognize him from his most recent performances at Ottawa Little Theatre, in Boeing, Boeing (Robert Lambert) and One Flew Over the Cuckoo's Nest (Billy Bibbit). Selected credits include Clybourne Park (Jim/Tom/Kenneth), Monty Python's Spamalot (Historian/Not Dead Fred/Prince Herbert), The Full Monty (Ethan Girard), West Side Story (A-Rab), Antigone (Creon), and Jeppe of the Hill (Lackey). J. also works as an arts administrator, theatre educator, and operations manager and DJ with Rhythm Force Productions. Thanks, as always, to his "West Side," Christa, for her continued love, support, and companionship. David is delighted to be working with Bear & Co. again after previously appearing in their productions of Comedy of Errors and Finishing the Suit. Often seen at The Gladstone both onstage and off, David has appeared most recently in Mæstro (performing in both English and French! ), and directed both this past fall’s Romeo & Juliet REDUX and last spring’s Vanya and Sonia and Masha and Spike. Beyond The Gladstone, David has recently been seen at the NAC in Anne & Gilbert: The Musical, in Vancouver in Mozart & Salieri (Seven Tyrants), and in a Sandy Hill found-venue staging of Frankie and Johnny in the Clair de Lune (Vacant House). David will be back on The Gladstone stage next year as Plosive Productions brings Phil Porter's international sensation Blink to Ottawa for its English Canadian première. Kat is excited to be touring the works of the Bard again this summer! This theatre ninja can be found working in various areas of theatre production, including acting (Twelfth Night of the Living Dead, Algonquin College), stage managing (Little Shop of Horrors, Theatre Kraken), lighting/projection (The Santaland Diaries, Theatre Vancouver), scenic painting (Macbeth, Bear & Co.), set building (Crimes of the Heart, Three Sisters Theatre Company), and sound (The Maltese Falcon: the Radio Show, Plosive Productions). She is currently developing (Un)Resolved, a play about true love and hard choices.